With its ideal growing conditions, rich soil and abundant sunshine, California supplies more than 80% of the global almond demand. U.S. almond growers and processors are committed to using farming practices that conserve the natural resources they depend on for their livelihood, serving their local communities by providing jobs and minimizing environmental impacts, and producing nutritious, sustainably-grown almonds to families around the world. Packed with powerful nutrition, almonds are not only good for the individual, but also good for local communities and the planet. Almond grower funds have supported extensive research covering production, environment, food safety and nutrition for more than 40 years – see almondsustainability.org and below image for the ongoing research areas that support the overall sustainability of California almonds. California almond farmers use 33% less water to grow 1 Lb of almonds than they did twenty years ago. Almond trees grow three things – the kernel we eat, hulls that are used as livestock feed, and shells which go to alternative farming uses such as livestock bedding. And at the end of its productive life, the almond tree is re-used. The almond industry partners with more than 30 non-governmental, governmental and academic organizations, such as The Honey Bee Health Coalition, Environmental Defense Fund and Sustainable Conservation. 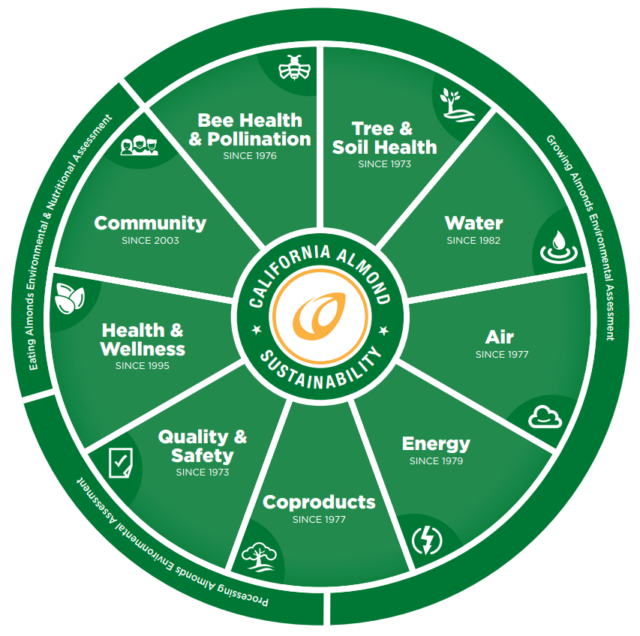 The 2009 California Almond Sustainability Program (CASP) helps to educate participants about continuous improvement as well as better understand the ongoing sustainability practices of growers. The Accelerated Innovation Management (AIM) program, launched in 2015, builds on the industry’s traditional research program and explores innovative ways to further improve water management and efficiency, recharge underground aquifers, and improve sustainability. The 2015 Growing Almonds Life Cycle Assessment (LCA) shows that almond trees accumulate and store significant amounts of greenhouse gas over the course of their 25-year lifecycle. Research shows that current almond growing practices offset about 50% of its carbon emissions and there is the potential to become carbon neutral or even negative. The almond industry has invested $2.3 million of its $3.2 million pollination research, on improving honey bee health. The results have helped inform best management practices that almond growers employ to protect both honey bees during the pollination season and the sustainability of this vital pollinator. There are 6,800 California almond growers and 105 handlers/processors, many of whom are multigenerational farmers who live on their land and expect to pass it on to their children. 91% of California almond farms are family farms, many of which are owned and operated by third- and fourth-generation farmers. The majority of these farms are less than 21 hectares (50 acres). The California almond industry generates more than 100,000 jobs, contributing to the economic viability and stability of communities throughout the Central Valley of California where almonds are grown. Almond growers and processors are part of the fabric of their local communities, providing direct and indirect employment and supporting local schools, businesses, and civic and religious organizations. The almond industry’s AIM program also helps the leadership of the California almond industry to find innovating and sustainable solutions that can translate to all of agriculture. California produces all of the almonds grown in the United States and 82% of all the almonds worldwide. Annually, California almond farmers harvest more than 815 million kilograms (1,800 million pounds) of almonds grown on more than 344,000 hectares (850,000 acres) which results in the almond industry supporting California’s economy by generating more than $21 billion gross revenue across all industries in California, adding $11 billion dollars to the state’s total economy. More than $2.5 million of grower funds are invested each year in next-generation research to fuel continuous innovation to grow nutritious food in a sustainable way. California is the world’s largest almond producer because it is one of the few places on Earth with a Mediterranean climate that is perfect for growing almonds. In addition to the ideal climate, rich soils, water availability and infrastructure, and innovative technology and research make the state’s Central Valley the most productive almond-growing region in the world. In the 2014-2015 crop year, the California almond industry exported 532 million kgs (1,173 million pounds) of almonds worldwide, of which 26% were shipped to Western Europe. 2012 USDA Agricultural CensusUniversity of California Agricultural Issues Center. The Economic Impacts of the California Almond Industry. 2014. Rendering meat and poultry by-products, and used cooking oil, is the best and oldest way to recycle the by-products of animal agriculture.